Guacamelee! developer Drinkbox Studios have announced that they’re working with publisher Leadman Games to bring Guacamelee! One-Two Punch Collection to the Nintendo Switch and Playstation 4. The physical release will include both Guacemelee! STCE and Guacemelee! 2 games, an instruction manual, a double-sided poster, and download codes for both game’s soundtracks. Guacamelee! One-Two Punch Collection will be available at various retailers on May 28, 2019 for $39.99. In the first Guacamelee!, you play as Juan Aguacate, a content farmer who is killed by the villainous Carlos Calacas. Juan reawakens in the Land of the Dead, where he is given a luchador mask that he must don to save his love interest Lupita. With your mask to give you strength, you will explore this hand-drawn, Metroidvania brawler and transcend between the Lands of the Living and Dead. 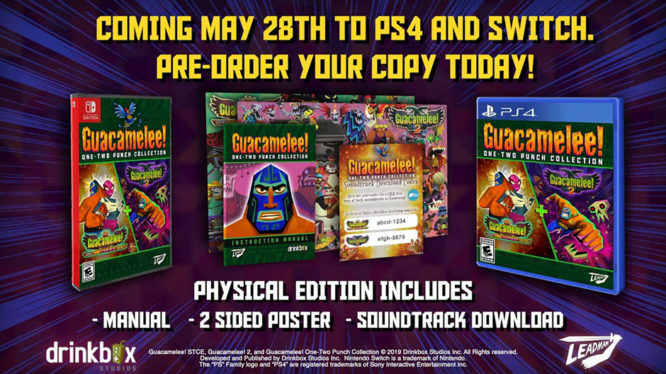 Taking place seven years after the original, Guacamelee! 2 continues the story of Juan and his now wife Lupita. Juan has retired the mask, and is noticeably out of shape for it, when the Mexiverse finds itself in danger. Trouble is brewing in a parallel timeline where Juan failed and Calacas won, but a new villain by the name of Salvador must be stopped before he ends every timeline. Juan has no choice but to relearn his fighting skills and become the luchador hero that everyone needs once again. Wrestle your way through Guacamelee! One-Two Punch Collection when it releases on May 29, 2019.